BMW’s 4-Series family has reached the midway point in its life cycle and has come in for a little nip and tuck to keep it looking fresh. The updates affect the entire range which consists of the 4-Series, 4-Series Convertible, 4-Series Gran Coupe and high-performance M4 and M4 Convertible. The changes, which will be introduced for the 2018 model year, are mostly cosmetic and follow similar updates recently introduced for the 3-Series family. Among the visual tweaks are new LED headlights and foglights and revised bumpers. There are also the new exterior colors Snapper Rocks Blue and Sunset Orange. Moving inside, buyers will find additional trim options as well as double stitching on the instrument panel. Menus for the infotainment system have also been revised. Mechanically, the standard 4-Series models have benefited from a stiffer suspension setup designed to deliver sportier handling without hurting ride comfort. This applies to both the standard suspension and available M Sport suspension and Adaptive suspension. Powertrain specifications for the United States are yet to be confirmed but we’re not expecting any changes as BMW added new engines to the family for the 2017 model year. This means the base 430i should continue with a 248-horsepower turbocharged 2.0-liter inline-4 while the more potent 440i should continue with a 320-hp turbocharged 3.0-liter inline-6. In addition to these two powertrains, buyers will also continue to have the choice of 6-speed manual or 8-speed automatic transmissions and rear- or all-wheel drive. We can confirm that there’s been no boost in output for the M4 which remains down on power compared to rivals such as the Cadillac ATS-V Coupe and Mercedes-AMG C63 Coupe. The car’s familiar turbocharged 3.0-liter inline-6 continues to deliver 425 hp as standard and 444hp with the available Competition Package. Pricing is yet to be released but should start close to the $43,145 starting price of the 2017 model. Note, this should be the final update for the 4-Series family before a complete redesign. A redesigned 3-Series debuts in 2017, and a redesigned 4-Series should follow a year or two later. 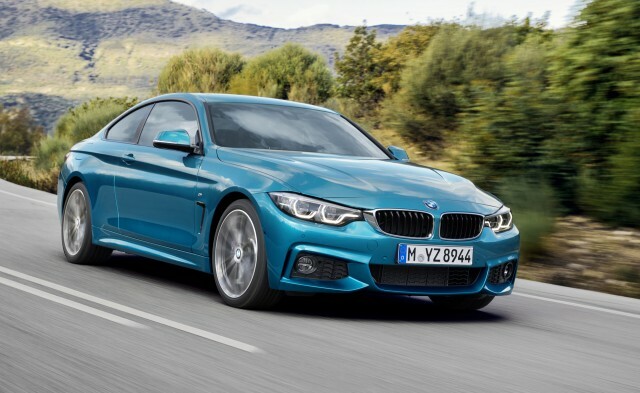 For more on the BMW 4-Series, read the in-depth reviews at The Car Connection.